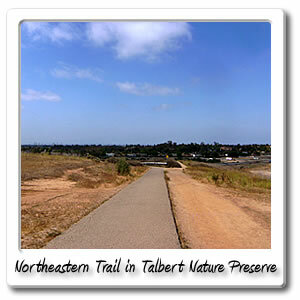 Welcome to Talbert Nature Preserve on the Santa Ana River bicycle trail. Upon exiting the wooden bridge you'll go for a half a mile, then you'll see a sign pointing to the left for a long exit to the Eastbound direction for Adams Street. You can also go right and then eventually you'll be heading over another bridge to the right, but that takes you over the Greenville - Banning Channel, then if you make a left, you'll be heading toward the Northern part and just a short portion of the large Talbert Nature Preserve, from there upon entering you'll find a steep hill if you don't turn off, to hit the mid section. 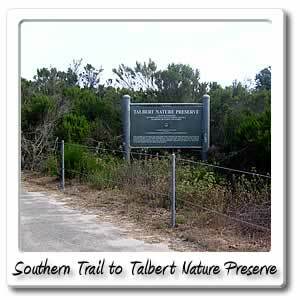 If after crossing the channel, you make a right, you'll be going toward the Southern part of the Talbert Nature Preserve if you go through for a half mile, large Fairview Park is to the east of the entire preserve. The preserve still makes up the area going South past the Victoria Street/ Hamilton Avenue entry point for the Santa Ana River. There's also another park that goes half mile south of Victoria, but just on the other side of the river trail. At this point you'll be about a mile from the beach. You can continue back to the beach by going south, but you'll have to get off at the Pacific Coast Highway bridge and go right, then get on the other side of the trail, by making a right, then going left to get to the beach or make a left to get back onto the trail heading north away from the beach. 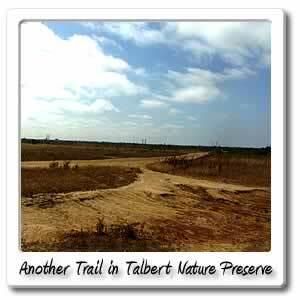 According to the County of Orange, who owns the park, the North Talbert Preserve is a section that consists of 91.5 acres. 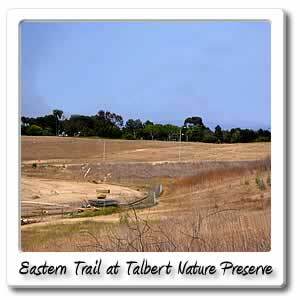 The southern portion which is the South Talbert Nature Preserve, has 88.5 acres. There's a wetland zone in the southern section consisting of 14.8 acres, most of which makes up Victoria Pond. The other five of the six zones in the park, that are specific to wildlife habitats are riparian woodland and mulefat scrub in the Alluvia Woodland zone is the most secluded of the six. Next there's an Intensive Use Area and then there's vegetation designed to screen the embankment and that maintains borders is the Border Planting zone. The Native Grassland is the largest zone. Gentle slopes and dunes make up the area that's considered destroyed from the result of civilization, makes up the Coastal Strand zone. Some of the trail is asphalt, but most of it is dirt trails considering, the park is geared more toward hikers. 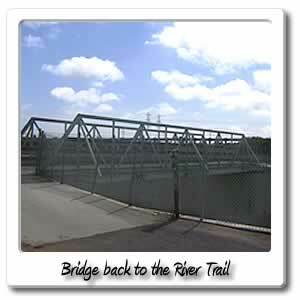 For the most part it is a 2 mile loop around trail with lots of rises and declines. 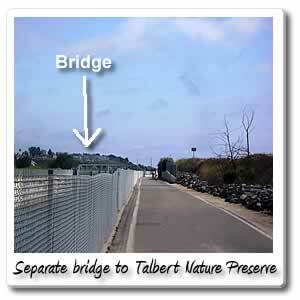 If driving you can find the Talbert Nature Preserve at 1298 Victoria Street in the City of Costa Mesa, but there's not any parking at that exact location. You can find some parking, up the hill going East at Victoria Vista Park. You can also go to the West and park at the Carl's Jr. Other places to park around the area also include Fairview Park, which has more parking spaces than any of the other places mentioned. Even Canyon Community Park has a good amount of parking spaces available to, which is more in the area of the South Talbert Nature Preserve.